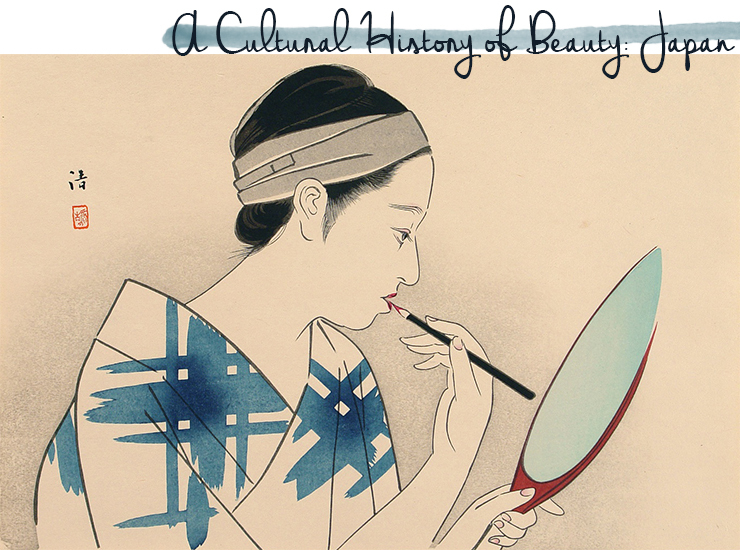 A Cultural History of Beauty: Japan. Looking back over the course of Japanese history, we know from passages in the chronicles Kojiki (古事記, "Records of Ancient Matters") and Nihon shoki (日本書紀, the second oldest book of classical Japanese history) that in ancient times there were customs existent of painting the face with red pigments. Starting from this rather primitive use of cosmetics, the Japanese developed a more aesthetic approach regarding beauty in the latter half of the sixth century when diverse forms of make-up such as rouge and powders were imported into Japan, along with other aspects of culture from Korea and China. The first to make face powder in Japan is said to have been a Buddhist priest, who delighted the Empress with his new invention. The white face powder was first made from rice powder and clay soils, but the more deadly white lead, imported from China, remained the prevalent choice until the 19th century. 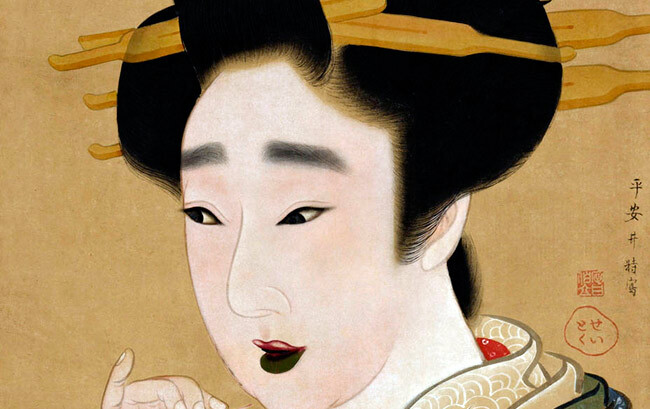 During the Heian period (平安時代, 794-1185), Japanese beauty products shifted from a mere imitation of Chinese models to an aesthetic that was more suited to the Japanese sensibility and customs - straight long hair, white powdered faces and repainted eyebrows developed within society. 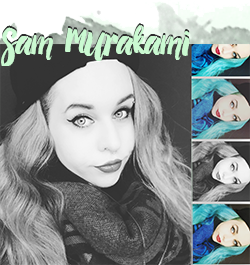 Many ideals that continue to shape the the aesthetic of feminine beauty first evolved in this era. However, make-up was still limited to the world of the elite.About the same time, a quite unusual beauty ideal set foot in Japan , which was the blackening of teeth, ohaguro (お歯黒) that was also customary in other parts of Southeast Asia. Teeth that were pitch black, such as glaze-like lacquer, were seen as beautiful and remained popular as a beauty ideal until the Meiji period. Many Westerners who visited Japan described ohaguro as an abhorrent Japanese custom which disfigured Japanese women. They conjectured that the purpose of this custom is chastity by making the women intentionally unattractive to prevent potential extra-marital relationship - however, many Japanese social scientists disagree with this theory. Based on the fact that Japanese girls were allowed a large degree of both social and sexual liberty until the time of Ohaguro when they resume the responsibility of wife and mother, it is much more likely that it was a social ritual by which both society and a girl herself celebrate the determination of matured women. With the approach of the Muromachi period (室町時代, 1333-1573) cosmetics are mentioned in several writings from this era which leads to the conclusion that face powders and rouge were well known to urban people. By the early Edo period (江戸時代, 1600-1868) there were elaborate treatises on etiquette and deportment for women that also gave detailed instructions on the proper use of cosmetics. During this period cosmetics centered on a palette of three basic colors: red (lip rouge, fingernail polish), white (face powder: oshiroi お白い), and black (tooth-blackener, eyebrow pencil). The white face powder was heavily applied to the face, neck and ears to create a stark white complexion, often artfully contrasted to the natural skin color of the surrounding skin with a carefully contoured edge at the lower neck below the hairline. The lips were painted onto the white foundation and usually rendered smaller and slightly higher than the natural lip shape. It was during this era when women were particularly concerned with the application of face powder in order to create a flawless complexion, that was regarded as "the essence of a beautiful woman". The Edo-period face powder was a white, lead-based pigment dissolved in water and applied with the hands or a broad, flat brush. 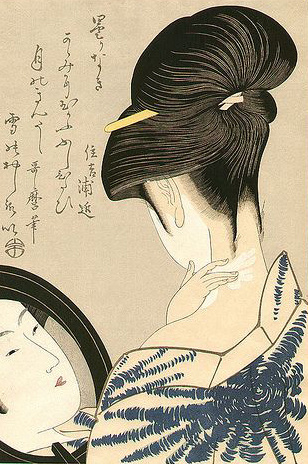 One brand of face powder even gained lasting popularity by doing "advertorials" with a ukiyo-e (woodprint) publisher. The pigments for rouge were made primarily from safflowers, and applied to the lips, cheeks, and fingernails. Like face powder, a light application was regarded as a display of refinement and sensitivity. In the late Edo period, however, there was a trend that leaned towards heavier application of lipstick - pigments that came from fresh safflowers became so expensive it was said to be worth its weight in gold. 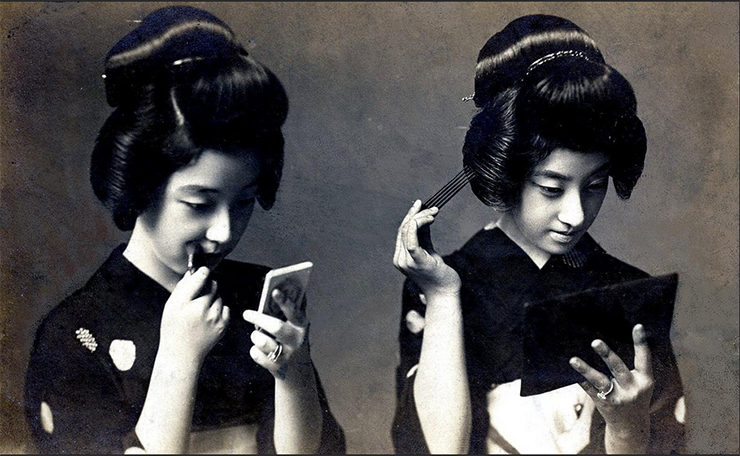 As Japan entered modern times, an official government decree of the third year of the Meiji period (明治時代, 1868 - 1912) outlawed the practice of tooth-blackening and eyebrow shaving among the peerage; and after Empress Meiji herself gave up blackening her teeth in 1873, ordinary women gradually followed suit. Around 1877, concerns over lead poisoning inspired a quest to develop a lead-free face powder, which was finally brought to market in 1904. 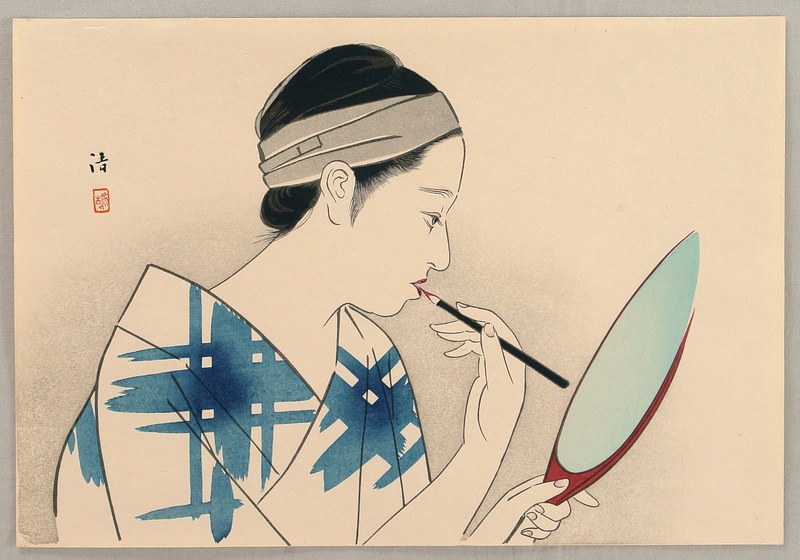 In the Taishô period (大正時代, 1912-26), the focus began to shift toward quick application and more convenient make-up practices that were interconnected with the advancement of women not only in society but also the workplace in general. Face powder began to be sold in a broader range of tints other than the traditional white, and tube lipstick using other pigments and dyes began to replace the traditional safflower-based rouge. Emulsions and variations of skincare products also appeared on the market, as cosmetics became increasingly westernized from the 1910s onward. Especially after World War II, beginning in the 1950s, Japan's aesthetics were heavily influenced by the American mass media, especially magazines and movies. In present days, Japan has advanced to one of the market leaders for cosmetics and beauty products and established itself with various innovations made in the name of beauty; the annual value of the Japanese beauty market is estimated at US$13 Billion. Shiseido is dominating the market, followed by Kose and Kanebo. Although the white heavy face powder look of the Edo period doesn't hold true today, beautiful white skin is still a crucial element as a beauty ideal for many Japanese. Japan has also made significant advances in scar tissue reduction techniques, which is a direct response to the emphasis placed on unblemished skin. 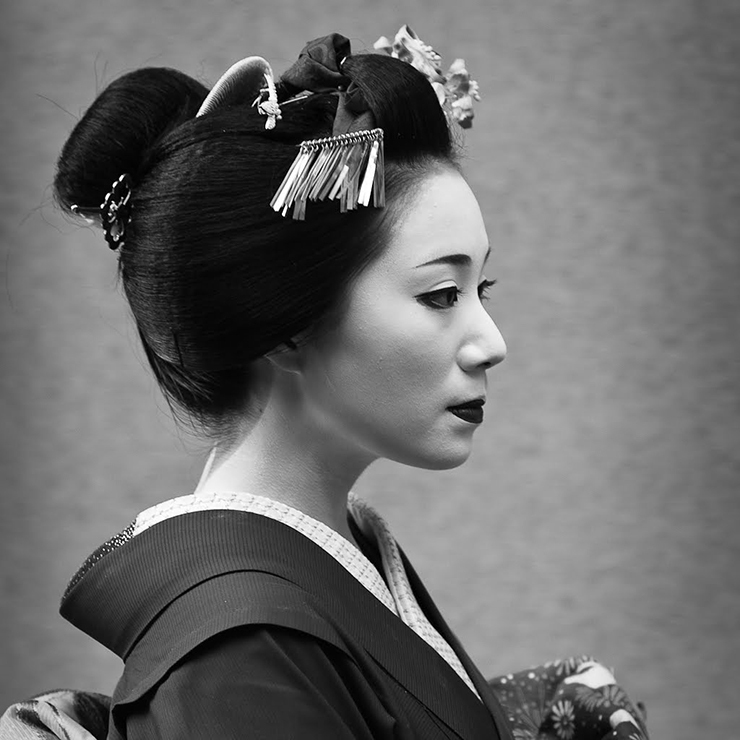 The traditional make-up today is limited to the stage and the world of geisha and maiko (apprentice geisha) but cosmetics remain a major part of women's -and increasingly so- men's lives.